The crisis-ridden national carrier Srilankan Airlines, which is bleeding the country’s resources, is now facing another threat – industrial action by its pilots. It was only last month the Cabinet of Ministers decided to infuse US$ 50 million to the airline to cope with expenditure it will incur during the daytime closure of the Bandaranaike International Airport (BIA). The runway is being resurfaced. It came on a recommendation by Public Enterprise Development Minister Kabir Hashim. The two state-owned banks — the Bank of Ceylon and the People’s Bank — will issue Letters of Comfort of one year’s duration to help SriLankan raise the loan. Some 69 pilots with 75 others sending in proxies met last Thursday (February 16) in an extraordinary general meeting where the decision to go for “industrial action” was taken. This meeting summoned by the Guild’s President, Captain Udayanga Stephen, the invitee pilots were told, was to discuss the “unacceptable conduct of senior management.” It could mean a strike or even a work to rule, said a member of the Pilots Guild. Though the Guild did not give the exact reasons for its threat to engage in industrial action, a Guild member said yesterday most criticism is levelled against the Chief Executive Officer (CEO) Captain Suren Ratwatte. Talks between the pilots and the CEO have led to acrimonious exchanges in the past. SriLankan Airlines is now in talks with Texas Pacific Group-Asia — for what is being described as a “public-private partnership.” These discussions have led to wide media speculation that the controversial firm Perpetual Treasuries is behind the deal through TPG Asia. The Cabinet of Ministers has decided that if this deal does not reach finality, a three-member ministerial team should negotiate with any future offers Srilankan Airlines may receive. It is headed by Minister Kabir Hashim and includes Development Strategies and International Trade Minister Malik Samarawickrema and Special Assignments Minister Sarath Amunugama. 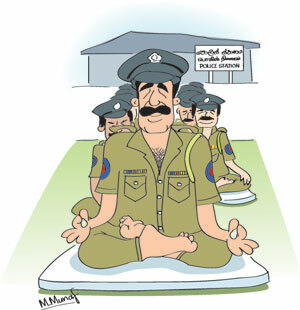 Police Chief Pujith Jayasundera has issued an unprecedented decree to all police stations and divisions countrywide – they should meditate every morning before they start work. He has said that such meditation should include Aana Paani Sathi — involving deep inhalation –and Maithri Bhavana. The decree was issued when he met senior DIGs for a five-hour conference on Wednesday morning. At one point, Mr Jayasundera declared that for good performance and to serve the public, one should meditate. He ordered the DIGs present to report back to him, once their orders were conveyed, on how the different Police units countrywide were carrying out his decree. A senior DIG in charge of a region adjoining Colombo was in a quandary. Being a non-Buddhist, he was not familiar with the rituals his chief proposed. He was heard telling his senior officers to direct all ranks under them to Vinaadi phaluvaka hondata usma ganna or breathe in an out for 15 minutes. Successive United States Presidents have strongly backed a two-state solution, one for the Palestenians and another for the Israelis, to resolve their raging conflict. However, the new US President Donald Trump declared this week that he was in favour of Israel’s choice, whether it is one or two states. In effect, he was endorsing the Israeli position of a one state, and was distancing himself from the policy of his predecessors. In the Arab world, the remarks sent ripples that Mr Trump was in effect shutting the doors for a negotiated settlement. Even the new UN Secretary General Antonio Gutteress expressed concern over Mr. Trump’s remarks. In what was a contradiction, the US Ambassador to United Nations, Nicky Haley, declared that her country was still for a two-state solution. The issue played out in Sri Lanka too though it was for different reasons. Revealed in these columns last week was the arrival in Colombo of renowned Israeli architect Moshe Safdie. He was the chief guest at the annual sessions of the Sri Lanka Institute of Architects. Architect Safdie in a letter to the Sunday Times claimed he was a strong believer in “a two-state solution” and has drafted “a proposal with a joint federal structure.” He said he had refused, “consistently” since 1967, to design settlements in any occupied territory. However, other sources said Safdie’s plan for Israeli settlements in Palestenian lands in 2008-2009 was stopped and another architect had taken over. The Cabinet Committee on Economic Management (CCEM) has asked the different ministerial committees now studying the Concession Agreement for the Hambantota Port with a Chinese firm to talk to members of the Buddhist clergy in the area. This is to win them over after the Police fired tear gas and water cannons at some of them who staged a protest in January at the ceremonial inauguration of the industrial zone near the port.The committees have also been told to conclude the provisions of the proposed Agreement without any further delay. For this purpose Sri Lanka and Japan will sign an Exchange of Notes. The Japanese government will provide Rs 327 million (250 million yen) from its General Grant Aid. Two Ministries – Law and Order and Transport – will acquire the equipment and hand them over to the respective organisations. The equipment, a Law and Order Ministry source said, would include communication equipment. Specialist Medical Officers who served the State and retired upon reaching 60 will now be entitled to duty-free vehicle permits. The Cabinet of Ministers which decided on the move has directed the Treasury Secretary R.H.S. Samaratunga to take action to implement this decision. The proposal to grant duty free vehicle permits was made by Health, Nutrition and Indigenous Medicine Minister Rajitha Senaratne. The country’s senior most diplomat Ranjit Uyangoda has ended up as Secretary to the Ministry of Co-existence, Dialogue and Official Languages. A member of the 1985 intake to the Foreign Ministry, he had been recommended for appointment as ambassador to Germany. However, in an unexplained move, his name was later withdrawn and the name of Saroja Sirisena was forwarded. In an era where school teachers, land dealers and small time mudalalis are posted as Sri Lanka’s envoys overseas, experienced career officers are being kicked around like footballs, said a veteran local diplomat. He said even big wigs favoured those close to former President Mahinda Rajapaksa. That was on the funny logic that one has to separate his supporters before hitting Mr Rajapaksa hard. This was despite promises during the presidential and parliamentary elections that the Foreign Service will be made a professional one where the most suitable will be appointed. Whoever is in power, it is the jobs for the boys that count. Defence Secretary Karunasena Hettiaratchchi has successfully undergone heart surgery in a Singapore Hospital. Acting in his place as Secretary now is Puttalam’s Former District Secretary Kingsley Fernando, who is now attached to the Presidential Secretariat. Former President Chandrika Bandaranaike Kumaratunga’s response to her being named the fungus laden packet of noodles or Puss Kaapu Noodle Packet eka (reportedly by supporters of Mahinda Rajapaksa) came when she addressed the Foreign Correspondents Association this week. “If this fungus laden packet of noodles can topple Governments, so be it,” she declared. She was alluding to the ouster of Mahinda Rajapaksa at the presidential election in January 2015. Will Right of Information Act makes a real difference to the people of Sri Lanka ? Are We Ready?